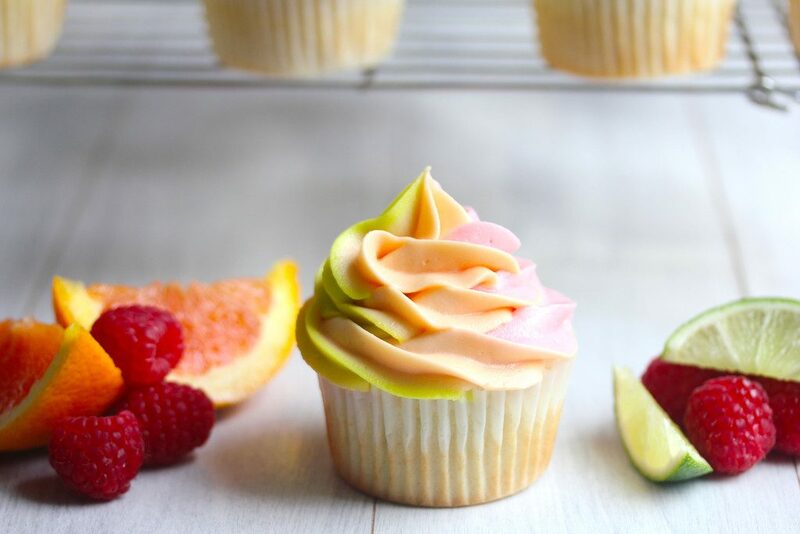 These Rainbow Sherbet Cupcakes pull all the sweet fruity flavors of rainbow sherbet into cupcake form. Raspberry, orange, and lime combine forces in both the cake and the buttercream frosting. I feel like I’ve stepped back into 2008 with all the cupcakes I’ve been making lately. OK, so 2008 doesn’t really sound like that long ago, but it was! It was 7 years ago. To be fair, when someone says, “back in 2000,” I also don’t think that sounds like a long time ago. I mean, how was 2000 15 years ago? #holdme. But I guess when you consider that back in 2000, I was playing field hockey, listening to Ricky Martin, and driving around a light blue Ford Taurus, it does in fact sound like decades ago (pshhh I still love me some Ricky Martin, though). My point is, when WANM was first launched, I was obsessed with cupcakes. As was the rest of the world. Since then, the craze has definitely died down, but I don’t think anything has really taken their place. There were some murmurings about doughnuts stepping up. People were even throwing around the idea of pie for a while. And while doughnuts and pie certainly became trendy, they never quite made it to cupcake status. Nothing really did… Except maybe kale? And green juice? 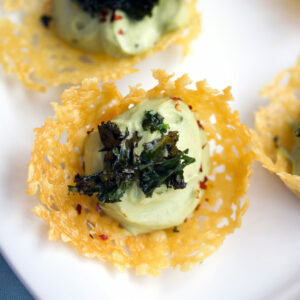 Did kale and green juice team up to take cupcakes’ place in the spotlight? Yikes. While I’m not exactly going on cupcake crawls these days, I don’t think I’ll ever get bored of making cupcakes. And I think they’ll always be a big hit at parties. Especially considering you really can flavor them and decorate them in an infinite number of ways. One dessert that I don’t think gets enough credit is sherbet. It seriously gets the short end of the stick and I’m pretty sure people should start paying it more attention. When I saw Baked By Rachel’s homemade version for Rainbow Sherbet, I fell so in love with the pretty colors and instantly thought of making rainbow sherbet in cupcake form. I had to play around with the flavors a bit, but think I got them pretty right on and these cupcakes are my new summer favorite! Next up, I’m definitely determined to make Rachel’s actual sherbet. The base cupcake recipe for these sherbet cupcakes is pretty much my cupcake standard. I almost always use the whipped egg white method because I think it makes for the lightest fluffiest cake. Start by pre-heating the oven to 350 degrees. In the bowl of a stand mixer or in a large bowl with a hand mixer, cream butter and granulated sugar together, until light and fluffy. In a separate medium-sized bowl, whisk together flour, baking powder, and salt. Slowly mix the dry ingredients into the butter and sugar mixture, alternating with whole milk. In another separate medium-sized bowl, whisk 3 egg whites with a hand mixer or whisk until stiff peaks form. Gently fold the egg whites into the batter, until just blended. Here’s where I decided to make three different flavors of cupcakes: raspberry, orange, and lime. You can do this if you want or you can just choose to make one flavor for all twelve. The frosting will contain all the sherbet flavors! If you’re doing all three, separate the batter into three bowls. Mix raspberry extract into one bowl, mix tsp orange extract into another, and mix fresh lime juice into the third. 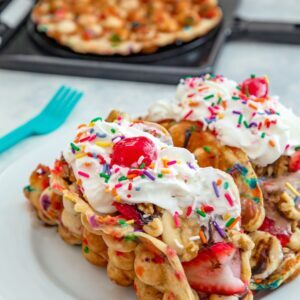 Then, in a lined cupcake pan or cupcake pan sprayed with cooking spray, fill each cavity about ¾ of the way full with the batter from each bowl. Bake sherbet cupcakes at 350 degrees for about 15-17 minutes, until a toothpick comes out clean. Cool them in tins for a few minutes before removing to wire racks to cool completely. 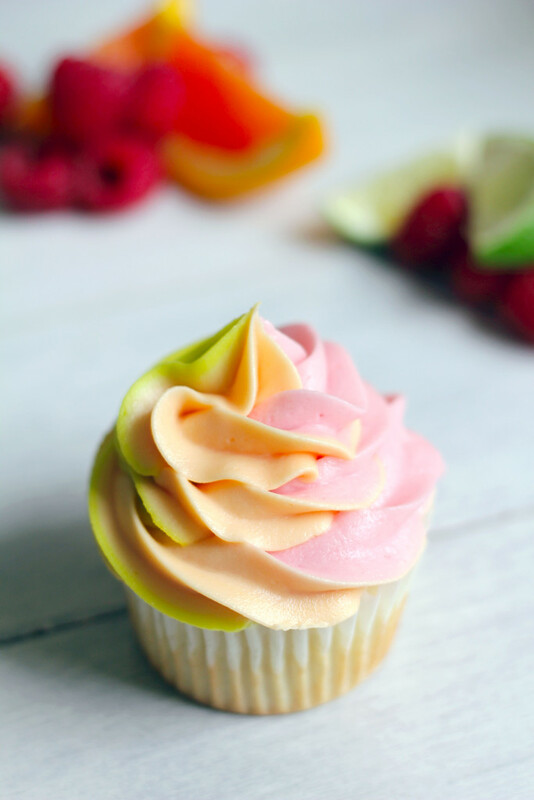 While the sherbet cupcakes are cooling, you can get going on the sherbet buttercream frosting. 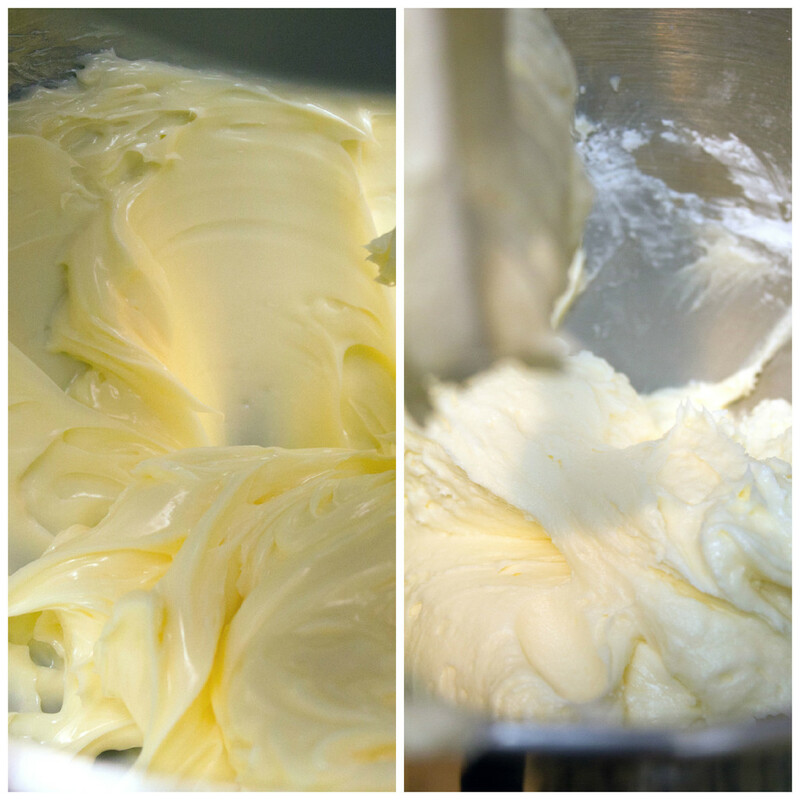 In the bowl of a stand mixer or in a large bowl with a hand mixer, beat butter until creamy. Slowly blend in powdered sugar, cup by cup until well-combined. Mix in milk. 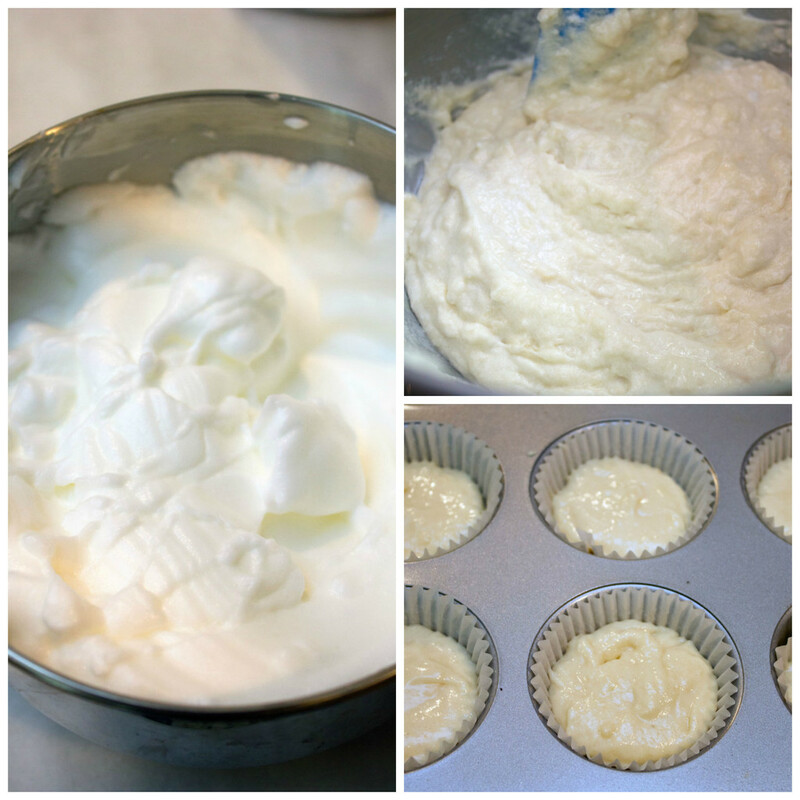 Separate buttercream frosting into three separate bowls. You’ll definitely want to make all three flavors for the frosting! For the raspberry buttercream, I decided to use fresh raspberries instead of extract, but you definitely don’t have to do this! If you decide to, it’s pretty easy. Simply put raspberries into a saucepan over medium heat and stir with a wooden spoon until they break down into a sauce. Continue to cook until sauce thickens. Remove from heat and pour through a fine mesh strainer, pressing on seeds with wooden spoon to extract juice into a separate bowl. Now, mix fresh raspberry juice (or extract) into the buttercream frosting in one bowl, mix orange extract into another, and mix fresh lime juice into the third. Then color each frosting accordingly. 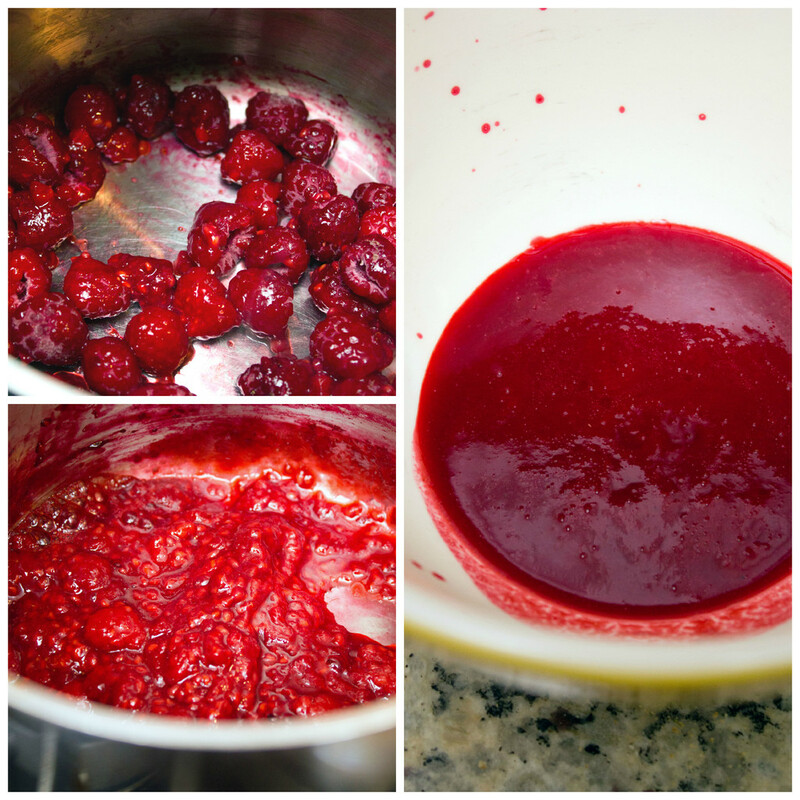 If you used fresh raspberries, you shouldn’t need any red food coloring! I highly recommend the Wilton Color Right Performance System for getting the perfect shades! If the frosting is too thick, you can add more milk, 1 teaspoon at a time. I highly recommend the Wilton ColorSwirl 3-Color Coupler for getting the perfect buttercream swirl. If you don’t have one, here’s a tutorial for getting the technique down. The Wilton coupler is incredibly easy to use, even for the buttercream decorating deficient like me! Don’t they look like sherbet? They taste like it, too! Which basically means they taste like summer. 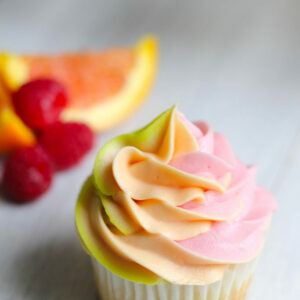 The fruity flavors of the sherbet cupcakes are nice and light and slightly tangy, just like perfect bowl of sherbet. I could eat the frosting with a spoon. Or my ginger. But the cake is also incredibly light and fluffy, also with a touch of fruitiness. I didn’t really have preference over cake flavors… They were all pretty splendid. I almost always choose ice cream loaded with the good stuff, like chocolate, cookie dough, and Oreos… Except when I’m in the mood for sherbet. And then nothing else will do. It just screams summer and makes me want to curl up on the couch with the windows open and a light blanket. And probably a spoon and entire carton to myself. And one of these sherbet cupcakes on the side? Would that be so wrong? Everyone knows that cake and ice cream go wonderfully together. And raspberry, orange, and lime should probably all get married or something. Because they just naturally belong together. Take one bite of this cupcake and tell me that’s not true. Dare you. Fine, I’ll go first. I feel like the 4th of July officially, officially starts summer. So, hi summer! Welcome. Let rainbow sherbet eating season commence. In whatever form that may be! I’m choosing sherbet cupcakes! 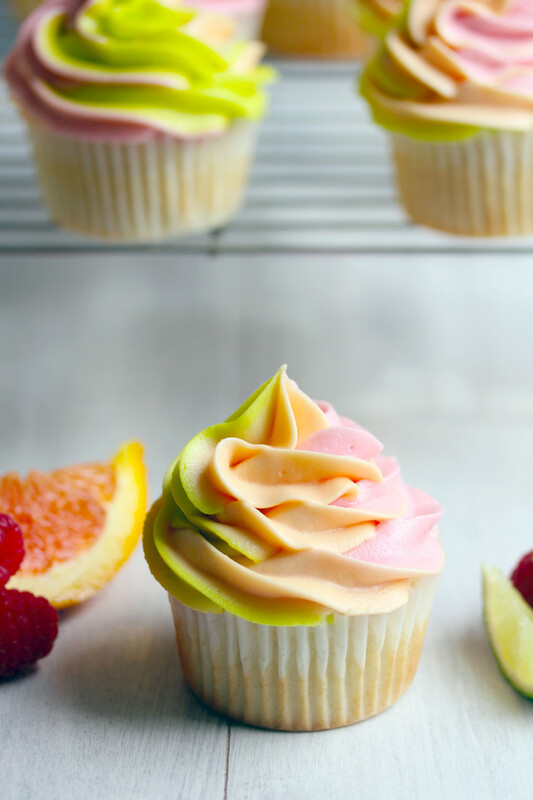 All the sweet fruity flavors of rainbow sherbet in cupcake form. Raspberry, orange, and lime combine forces in both the cake and the buttercream frosting. In the bowl of a stand mixer or in a large bowl with a hand mixer, cream butter and sugar together, until light and fluffy. In a separate medium-sized bowl, whisk together flour, baking powder, and salt. Slowly mix the dry ingredients into the butter and sugar mixture, alternating with the whole milk. In another separate medium-sized bowl, whisk egg whites with a hand mixer or whisk until stiff peaks form. Gently fold the egg whites into the batter, until just blended. Separate batter into three bowls. Mix raspberry extract into one bowl, mix orange extract into another, and mix fresh lime juice into the third. 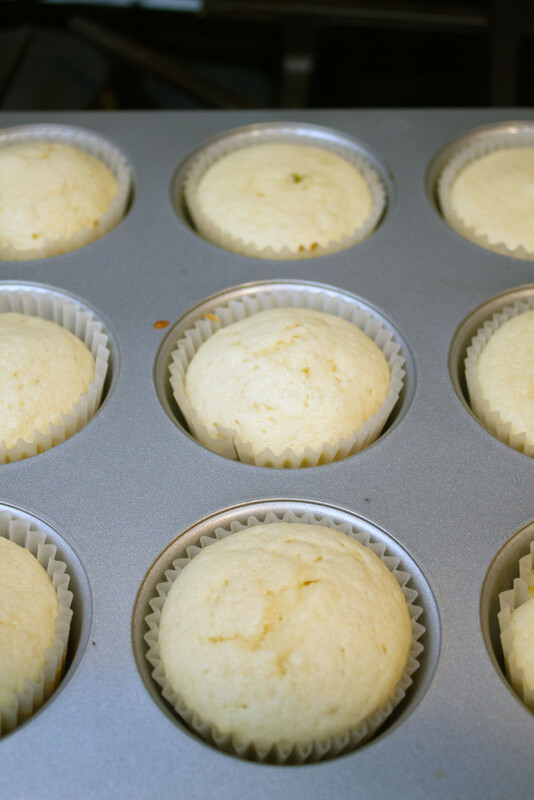 In a lined cupcake pan or cupcake pan sprayed with cooking spray, fill each cavity about ¾ of the way full with the batter from each bowl. Bake at 350 degrees for about 15-17 minutes, until a toothpick comes out clean. Cool cupcakes in tins for a few minutes before removing to wire racks to cool completely. 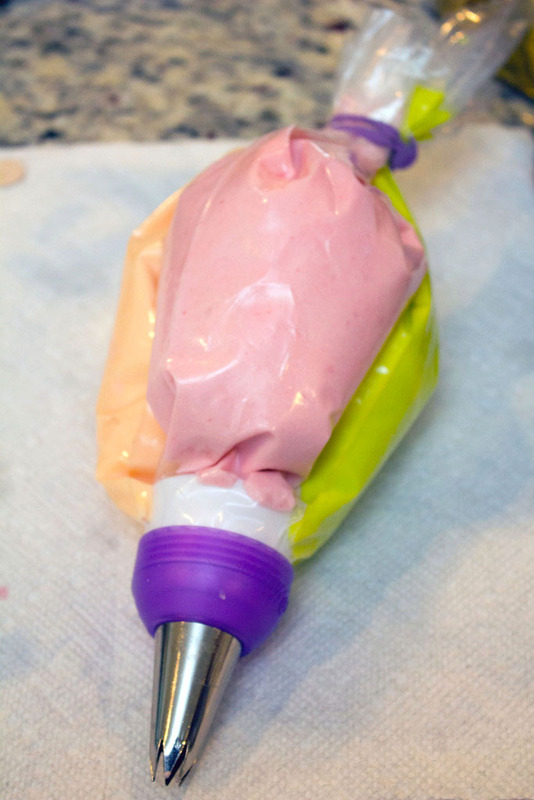 Using the Wilton ColorSwirl 3-Color Coupler and a 1M pastry tip or following this tutorial, frost cupcakes with sherbet buttercream. Slowly blend in the confectioners' sugar, cup by cup until well-combined. Mix in milk. 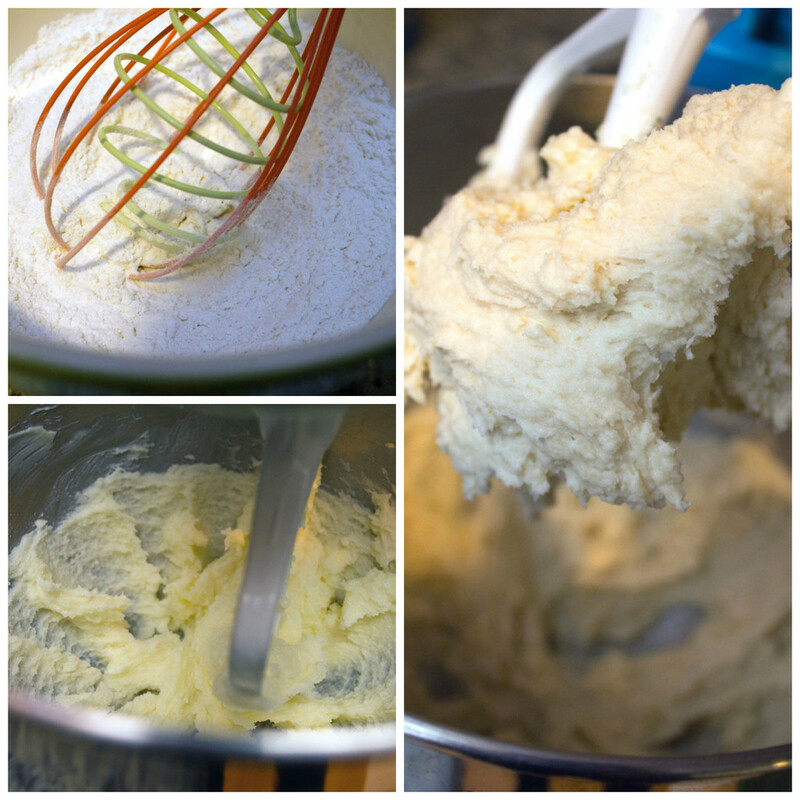 Separate buttercream frosting into three separate bowls. If you're using real raspberries instead of extract, place them in a saucepan over medium heat, stirring with a wooden spoon until they break down into a sauce. Continue to cook until sauce thickens. Remove from heat and pour through a fine mesh strainer. Press on seeds with wooden spoon to extract juice. Mix 2 t fresh raspberry juice (or raspberry extract) into frosting in one bowl, mix orange extract into another, and mix fresh lime juice into the third. 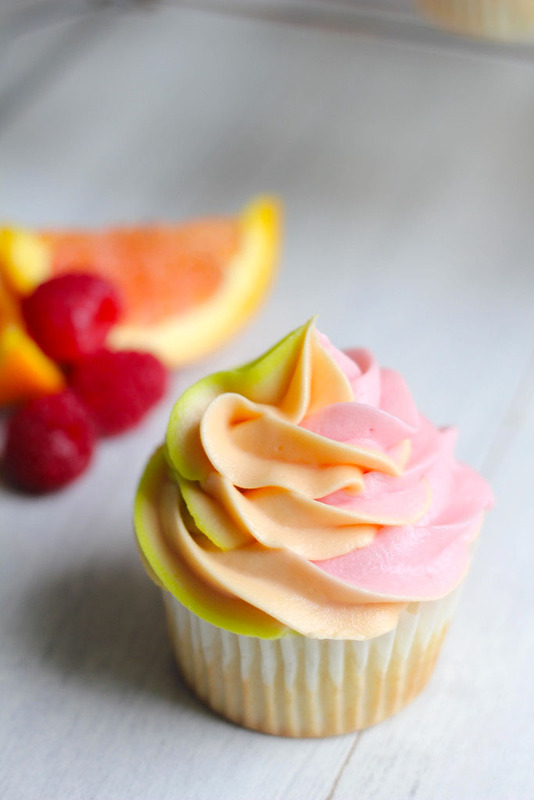 Mix orange food coloring into orange extract frosting and green food coloring into lime extract frosting. If you used raspberry extract instead of fresh or frozen raspberries, mix red food coloring into raspberry frosting. If frosting is too stiff, more milk can be added 1 tsp at a time. 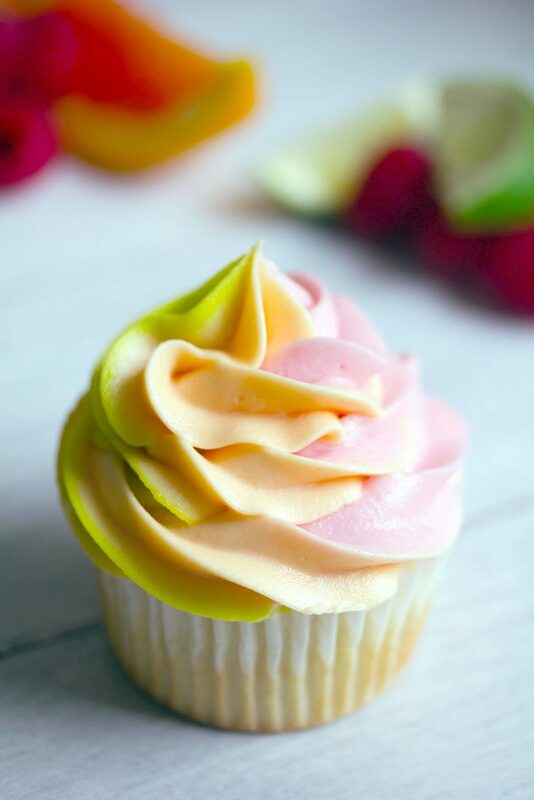 24 Responses to "Rainbow Sherbet Cupcakes"
These cupcakes are absolutely gorgeous, Sues! That frosting looks just perfect. I wish I had these for breakfast today! Delish! 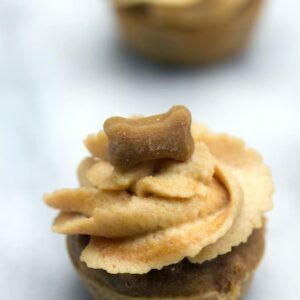 Hi Sues, as always your posts are mouth watering, I am so in love with these fabulous cupcakes, they have the most gorgeous frosting. That frosting bag for 3 colors is a must have, thanks for sharing. I truly can’t stop admiring how beautiful they are, the colors are almost a pastel shade, which I love. So. Dang. Pretty. I would take these over the actual rainbow sherbet any day of the week. I can’t get over that swirl! What a happy looking cupcake! I’ll be making these but sandwiching it with macaron shells and that fun sherbet buttercream frosting. 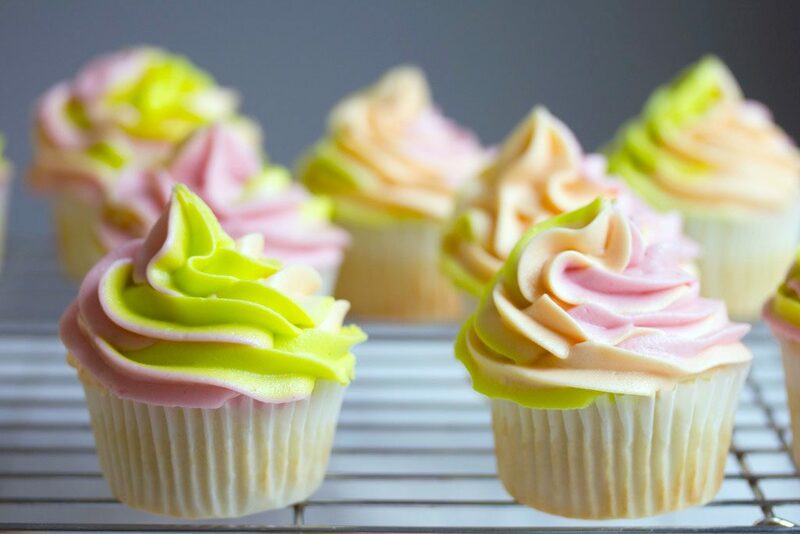 Rainbow sherbet cupcakes are such an incredible idea! They look absolutely gorgeous! 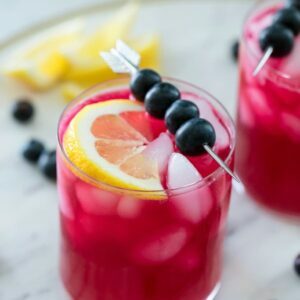 Love the fun colors and I can just imagine how amazing they taste! You have that swirl perfected! I love it! You always make the most beautiful cupcakes and these remind me of summers of as a child when I used to snack on rainbow sherbet. But in cupcake form is even better! These are the prettiest!!! Ha, Ricky Martin was SO BIG in 2000. I think you might be onto something with that kale/green juice conspiracy theory. Wait, 2008 was HOW long ago… it does not feel like it! These cupcakes are SO cute and colorful, I love them! Their colors are amazing! Beautiful cupcakes! Ah! These look great! I love the tri-color frosting. Definitely looks like rainbow sherbet. This would be great for a kids birthday AND red/white/blue combo for Fourth of July. 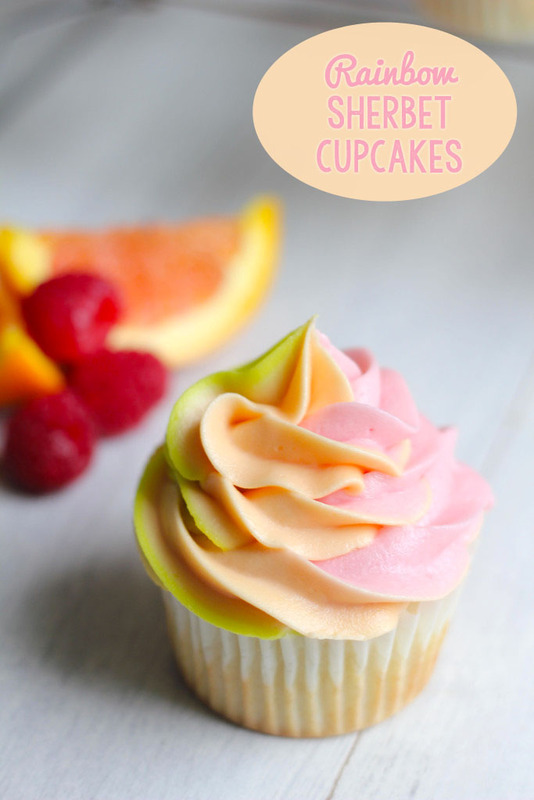 These are super pretty cupcakes and I love those flavors! Pretty! And ive not seen that piping technique before, will have to try it out! I’d rather eat cupcakes than pie or donuts any day! Especially when they’re as pretty as these are. Love that swirl frosting! What pretty cupcakes!! The frosting looks incredible! What a clever idea! These look amazing and I love rainbow sherbet. Definitely a recipe to bookmark. These look awesome! Silly question though, did you put all three flavored batters into each liner? Or were there three separate flavored cupcakes? @Leah Good question! You can actually do either (I’m going to update my post to make that more clear). I made three separate flavors of cupcakes, but you could add a scoop of each flavor to a cupcake paper and it would have a nice tye-dye look!